Leading law firm King & Wood Mallesons recently refurbished their Brisbane office to create a more functional and flexible workplace, introducing casual meeting areas, breakouts and group study spaces. “Designed by HBO+EMTB, the 3,700sqm fitout integrates a vibrant colour palette with black and white panels and slatted timber to create a sophisticated work environment. 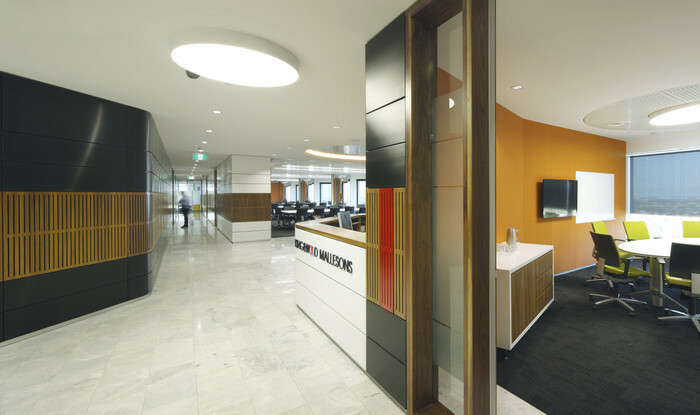 Vibrant sculptural walls create focal points across the work floor. Multifunction rooms open up to the reception to provide a large, flexible space for functions and events. Glazed frontages on built spaces has retained views to the Brisbane River and maximised the natural light filtering into the floor plate.